I wish all the fabulous weekend ..
Sea, sun and good mood! as you are my flowers ...? Les deseo a todos el fin de semana fabuloso ..
Mar, sol y buen humor! como lo son mis flores ...? Love the green jeans and the blouse! Fine look! Cute outfit! It looks good on you. Ohh I really love your top! I wish you all a great weekend!! All this green looks great on you. I adore it. 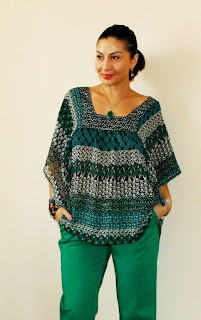 Your structured green pants and the loose fitting shirt is cloud nine! I love it together. You look very beautiful. You look great, I like your outfit combo! BEAUTY! I loveeee the green on you, you look amazing! great outfit!love the green pants! green looks good on you! !